Apple has released the Mac OS X Lion USB Drive, but I doubt it’ll be a hit for $69. Ouch. If you have already bought (and upgraded to) the Lion, you can create your own Mac OS X Lion Install drive using any spare 4.3Gb+ (8Gb to be safe) USB thumb drive. Here is how. Insert your USB drive into a USB port, and launch the Disk Utility. Click your USB drive in the drive list at the left, and select the Partition tab. 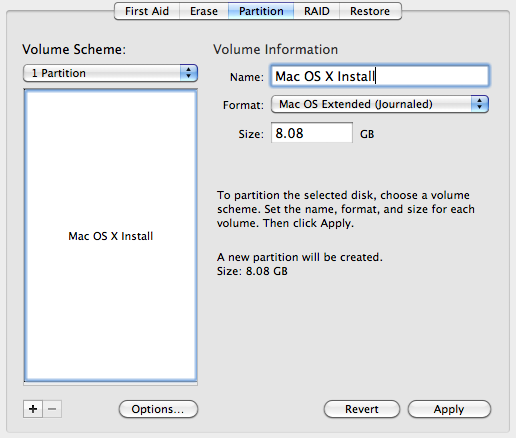 Change the volume name to Mac OS X Install. Reinstalling the PHP5, GD and libpng failed to fix this for me, so I’ve decided to check the loading order of the PHP extensions in the extensions.ini. Indeed, the gd.so was being loaded the last. Moving the “extension=gd.so” line to the top of the list fixed this problem for me after a restart of Apache. So give it a try before googling for the “Abort trap (6)” error like I did, the search results contained mostly mailing list noise and bug reports fixed in earlier versions of PHP.